The eleventh in a series of biennial Language and Development Conferences will be held in New Delhi, India on 18-20 November 2015, with the theme "Multilingualism and Development." Of the previous ten conferences, two have been held in Africa (2005 in Addis Ababa, Ethiopia and 2013 in Cape Town, South Africa) and the other eight in various parts of Asia. Nevertheless, the conference topics seem as relevant to African realities as those in Asia and elsewhere. ... explores the role of language in development. It addresses the issues of world, national, second and minority languages and the role they play in economic, social and cultural development; language policy, conflict transformation, language rights and identity; communication, education and development and language pedagogy. The roles of English in multilingual developing countries: empowering or marginalising? The attention to English among the possible issues is perhaps a function of the British Council's co-sponsorship, as well as the fact that English is one of the official languages of India (which is hosting this year's conference). No problem there, but it is notable the prominence of Britain in organization of many of the past conferences, and the absence of major donor countries like the US and France. UNESCO and the African Academy of Languages (ACALAN) are listed among the co-sponsors of the 2013 event, Germany's GTZ was a cosponsor of the 2011 conference, and several Australian organizations were involved in organizing some of the early conferences. More on language maps with focus on Africa. This picks up a discussion begun in an earlier post, "Second most spoken languages in Africa." One of the reactions (by several people on Twitter) to a set of maps and diagrams of the most spoken languages in the world published in the Washington Post's April 23 feature "The world’s languages, in 7 maps and charts"- in particular the diagram at right - was a question as to why Swahili was not included. After all, estimates of speakers of Swahili run as high as over 150 million. African languages do tend to get overlooked in various contexts, but in this case it seems that the criteria used - "native language" - was the deciding factor. Swahili is widely used as a second or additional language (L2 being the common abbreviation) but relatively fewer people speak it as a first or native language (L1) - somewhere in the range of 15-50 million (more on such estimates below). This is not enough to make this chart, which deals only with L1s. The number of L1+L2 speakers of Swahili is in the 60-150 million range. The map/diagram at right was posted on Twitter as a reference in the above discussion. (Thanks to Prof. Calestous Juma of Harvard University for calling our attention to it.) This comes from an article entitled "International Mother Language Day 2014" on the elearning-africa.com site. However the figures given for "six of the most widely-spoken languages" clearly have to do not just with maternal language (L1) speakers, but also with L2 speakers. "[I]t is of course extremely difficult to count numbers of language speakers, especially when the data is vague. Should only first-language speakers be counted? But then, what about Kiswahili and Hausa, which have fewer native speakers but are used across wide geographical areas as trade languages? It is important to remember that any depiction of African languages, other than the most exhaustive study, will be a compromise at best." The closest we have to an exhaustive study of numbers of African language speakers continentwide would be the figures compiled by Ethnolgue, though these are themselves often estimates and works in progress. 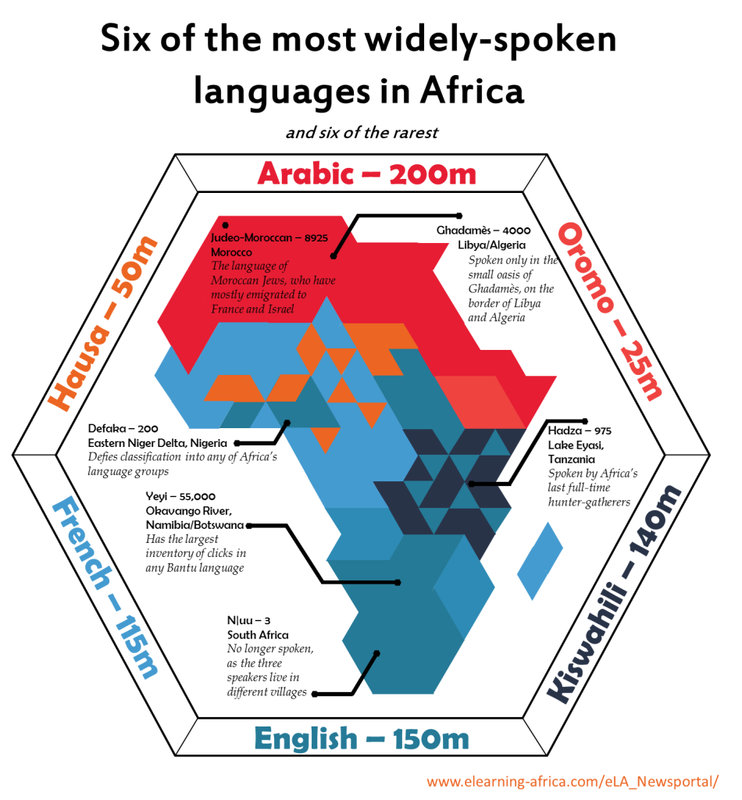 Still, one could work with such figures - as well as other research on language use in specific parts of Africa - to outline the top most spoken languages at different geographic scales - continental, sub-regions, countries, and provincial. These could in turn be presented in map layers. The utility of such data would be in better informing development/extension projects and relief efforts (such as that against ebola recently in West Africa) in which communication, participation, and education are fundamental.. In some cases the languages appear to be listed in order of number of speakers, but in others not - it would help to do the former consistently. I corrected one of the language names for Guinea - "Futa Jalon" is not a language, but a region where Pular, a variety of Fula, is spoken. Also about Fula, the listing of "Fulfulde" and "Pulaar Fulfulde" from Mauritania through Guinea Bissau needs review/revision. For Ghana, Fante and Asante-Twi could be consolidated to Akan, and one of the northern languages could be listed. I removed "Hima" as a language of Rwanda and Burundi. It's a name (or dialect) of Nkore, which although related to Kinyarwanda/Kirundi, is a language of Uganda. In Rwanda and Burundi, Ethnologue considers it "an ethnic group (not a language) which speaks Rwanda or Rundi." On the other end of the spectrum - that of "granularity" of linguistic data - there is a set of detailed maps of "Distribution of African Languages" on muturzikin.com (an image of these together as presented on their site is on the right). In some ways this impressive work addresses the need for more accurate maps, although it has no indications of level of use (per numbers of speakers). Also, since in multilingual Africa, language use overlaps and rarely if ever respects borders or boundaries, it would be useful to see some kind of layering feature, as well as the ability to zoom out and drop some detail in favor of aggregated data on more widely spoken languages. The latter maps of course focus only on African languages, and without reference to the Europhone languages used in many countries in official capacity and/or as lingua francas (L2s). Another adaptation, therefore, could be on the continental level, to list the top most spoken languages (L1+L2) per country, including all tongues. This would bring us back to the map of "second most spoken languages" in Africa proposed by Olivet Nazarene University. A more detailed look at that effort will be the subject of the next posting. In an article last January in The Guardian's Global Development Professionals Network, Maria May suggests "Six resolutions for aid workers" in 2015: 1. Be the best manager ever; 2. Read; 3. Write; 4. Spend more time in the field [i.e., don't let it slide down the list of priorities]; 5. Walk the walk [development "organizations need to exemplify the change that they are trying to make in society"]; and 6. Renew yourself. I'd like to suggest a 7th resolution for 2015 - never too late to improve practice - which is particularly important in multilingual contexts commonly encountered in development work in Africa: Be a little bit of a linguist. What I mean by that is to pay attention to what languages are used and might be used, and how, in all levels of development work - especially on the level of beneficiaries and their communities. Participation: Who's talking? Who's not talking (or understanding)? These are issues even in monolingual communities, but where more than one language is spoken, try to observe what the use of or shift among languages means in terms of who does and doesn't participate fully - or at all. Typically use of an elite language or a language spoken by a majority in the community will favor people in leadership positions. Choice of language may reflect power as much as a desire to reach the most people. Gender: Related to the previous point, what do women speak and not speak? Women tend not to have as many languages as men, due to lack of formal education of girls, as well as to the opportunities even unschooled men have to travel and interact with speakers of other language speakers in their region (and beyond). Try to get an idea of what languages women use in homes, community, and local markets, and what gaps there may be for their direct communication with government, extension agencies, development projects, school staff, etc. Interpretation: Where it is necessary to work across more than one language, what is the quality of rendition in the target language(s)? If you don't speak the target language you have to trust the interpreters who do, but don't do so blindly. You may have seen a spoof of movie subtitles where an actor speaks a long piece and the subtitle has one or two words - be alert to shortcut summaries and query the interpreter when s/he gives you one. * In 2010 I sat in on a training of community animal health workers in Moroto, Uganda, who requested a change of interpreter to one who had better command of relevant vocabulary in Karamojong language. If there had not been that alternative, what might have been lost in translation? Check to be sure of the interpreter's confidence in the technical topic(s) being discussed before putting them on the spot to translate for you. Translation: Can you bring talking points translated in the target language to the field? At its most basic level, interpretation is oral and translation written, but development work rarely involves the latter when "local languages" are involved. Yet "pre-translating" key concepts and terminology might be helpful as aids to ensure good interpretation and reduce "slippage" in conveying information. Translation is also a key to localizing ICT4D (see below). Local radio: What languages do they use? In my experience in West Africa, community radio stations split their programming among whatever languages are spoken by people living within their broadcast radius. With expertise across languages (including finding ways to express new concepts in them), the staff of a station in an area where you are working could be a valuable partner for both for understanding the sociolinguistic profile of the area and for messaging to reach all groups. ICT4D: Applications, software, and content that do not respond to the linguistic realities of the population will have a limited utility - or utility for a limited number of people. Localization (L10n) involves translation and adaptation to local culture and communication. Projects in information and communication technology for development (ICT4D) and efforts to develop L10n in the same countries would seem to be natural allies with complementary interests, but it may be up to the better funded ICT4D projects to reach out to make this connection. One by one, such issues may make perfect sense, but even when taken together, the reasons for attention to language as a factor in development have not led to a real understanding of the role of languages in development, or what we might do better in multilingual contexts - and with less-resourced languages - to improve practice and outcomes. The link between language and development is "largely ignored" according to Ekkehard Wolff. Robert Chaudenson has suggested that the subject of language is "taboo" in development work in Africa. And Birgit Brock Utne noted that foreign donors have a negative view of African multilingualism. This is a problem and we can do better. * An episode of interpretation recorded on video in southern Afghanistan, with translated subtitles, is an example of shortcuts or just bad interpretation. There are other dynamics going on in the video, but the segment about midway through with the local elder is worth viewing. On a similar topic: "Back again. Gates, Rockefeller & African languages" 14 Sep 2006. A news feature on the Olivet Nazarene University site presents a map showing "The Second Most Spoken Languages Around the World." This is an interesting effort to get below surface descriptions of language use. As a Washington Post feature last year on languages in the U.S. put it, "Top-line statistics often reveal little. But peel back the first set of layers, and you reveal a lot of diversity - and history." However, when dealing with the complex linguistic landscape of Africa, this effort runs into problems. The first issue is assuming that "The most spoken language in any country is often obvious; usually, it’s the official language of the country." In Africa this often is not the case, if by "most spoken" one counts number of speakers. An example is Mali, whose linguistic profile was explored on this blog in discussing the long-tail of languages - Bambara is certainly more used than the official French. South Africa has 11 official languages (the Olivet site incorrectly lists only one of them - Zulu - as official). So one of the official languages will be second most spoken. Perhaps that is Xhosa as indicated, but the model focusing on official languages hasn't worked here. Rwanda has three official languages (Kinyarwanda, French, and English), and Central African Republic two (Sango and French). Since the site doesn't consider these official languages in discussing second most widely spoken, it is reduced to stating that Swahili is "second" most used in Rwanda, and that indigenous languages are used in CAR - which doesn't tell us much. Ethiopia has Oromo listed as the second most spoken language, but the detailed info notes that it is actually the first most spoken, with the official Amharic being second. So shouldn't Amharic be listed on this map instead of Oromo? The type of situation in Ethiopia and Mali is probably the rule in African countries where one or two indigenous languages dominate (even when a Europhone language is official and therefore assumed to be the key linguistic descriptor for the countries). A second issue is that in reading the individual country descriptions, it seems there may be a confusion between second most spoken language and most spoken second language (L2). This is a key distinction between numbers of L1+L2 speakers for the former (which will be predominately L1 for many languages), and just L2 speakers for the latter. When discussing English in many countries - one focus of the Olivet effort - almost all speakers will be L2, but that would be a special case within consideration of what language is second most used (per the title of the page). In the case of Liberia, however, where English is official, reference is then to local languages as "most common second language." A minor issue is reference to "tribal languages" - not used in academic literature, and has negative messages in other contexts. Another one is the coding used for languages - many of the two-letter abbreviations coincide with the standard two-letter ISO 639-1 codes, but others do not (Bambara would be "bm," not "ba"; Chichewa would be "ny" like Nyanja [same language]; "As" for Asante in Ghana would more appropriately be "Ak" for Akan. Where there is no ISO 639-1 code, then either an invented 2-letter code or better yet, a three-letter ISO 630-3 code could be used. Consider tracking third most spoken languages. Much of the work towards this will have been done anyway, in sorting through numbers to determine what is second most spoken. Keep in mind cross-border languages - Hausa and Swahili are well known, but Chewa and Nyanja are the same (as indicated above) and Bambara and Dioula (aka Jula) are mutually intelligible - could further development of this project include ranking regional (crossborder) languages? See also the follow up more detailed analysis in Part 2.